Marla Helton talking about one of her beautiful creations during an opening of a selection of her gourds on display at LibertyTown through tomorrow. I created a funky gourd in my workshop today which was really fun! I have called it Meow. And then I got home to find out that I'm featured in a treasure on Etsy called Tea and Cupcakes. Made my day! Marla Helton's small show of gourds is up at LibertyTown for the weekend. I took her class last night where I learned to stitch the cording around the top of the gourd with embellishments. I didn't finish it, so no picture here of My First Gourd, but I will show you my finished work as I get pictures. The "gourd" above is not actually a gourd, as you can see, but is a woven, shaped piece. This is one of Marla's Wild Women. They are made from pieces of gourd with beads and fiber and beads and wire...and more. They are fabulous and fun! My pictures of her pins did not come out, but some are wild women faces with hair and features. I'll try to do a better job with the photography later this weekend. The starting gourds come in all kinds of amazing shapes and sizes. Here's a gourd shoulder bag. She has several on display. She orders the gourds to make these from California. I love the shape and elaborate weaving on this one. I thought the beading on this one was beautiful. This is a sample of the technique I was learning about last night, only more elaborate in decoration. The piece in the center of these three gorgeous things is a woven gourd using a pottery structure around which ribbing of vine is constructed so that ribbons and other things may be woven around to make the round shape of a gourd--without actually being a gourd. That will be Sunday's workshop! We still have openings if you want to join us today and/or tomorrow from 10-5. Descriptions on the LibertyTown website--see link to the right. I pushed back the flying leaves in the sky and added a few mountain dwellings that can be seen from the front porch rocker. More about this one later. Tonight I plunge into a two and a half day set of workshops on gourds led by Marla Helton. It is being held at LibertyTown and is sponsored by the Fredericksburg Area Spinners and Weavers Guild--nicest group of people in the world. My buddy and fellow LT artist, Lynette, grew up with Marla and is hosting her for the weekend. Marla has brought some of her works with gourds with her and we will set up a small showing at LT today to run through Sunday, March 1. If you're in the area, come by for an opening reception tomorrow night 6-8 pm. This picture is a little dark as compared to reality, though the paper I am using IS pretty dark with age. This is the piece I had in a previous post marked as "beginnings." Below is yesterday's addition. I based my shape on a jelly bean machine that Bill, a talented colleague of mine at LibertyTown, keeps in his studio. His work is so cool, he doesn't even need the bribe to keep people coming back to see more! Above is the first layer of midnight blue acrylic and prints on 12 x 16 (10 x 16?) canvas. What I added yesterday--tentatively entitled Birds on a Wire. Today I hope to make progress on commission work on slate and to add a gumball machine on the "piles" collage piece. Of course, what will happen once I actually get started is anyone's guess! Today's work: It's a little hard to see since the birds and their egg are made from aluminum cans--a tricky lighting situation. I'm having fun with titles: That's the last time we go drinking! or It looks like he's going to take after your Uncle Al. Or It's YOUR turn to sit on it. Any other suggestions for a title? Here are some starts I made last week that I hope to make progress on this week. My student load has dropped some--it's that time of year--but below is one of my faithfuls. She was working on her own drawing, and I sketched her onto a scrap of this weird new multimedia board. I got a piece of it from my friend Cheryl who owns a framing and art supply store here. She's tried pastel, oils, watercolor, and other media on it. I decided I'd use the larger scrap for my collage --If a Red Hand (see previous post). The best thing I know about the product is that is flexible as to media. The worst thing I know is that it is not flexible when you bend it. It snaps off into odd shaped chips! I'm not sure what I'll do next with Little Girl, here. This piece is about 3 x 3. The canvas square below is at the same place I started to create Why Young Mothers. I haven't found the next right thing to put in my tree, but I'll be looking. This will finish out at 8 x 8 or 10 x 10. Don't you just love this--Piles--when I first looked at it, I read it as Pills! This is on more of that multimedia board and is about 5 x 5. I really love working small. The little balls are in oil paint. This is a canvas, 12 x 16, with the first layer in acrylic in my new favorite color for underpainting--midnight blue. I have had such a fun, productive week creating art. This piece is one I have been cogitating on for a while-- waiting for the right time and place. It finally came together this week. I created the back ground by doing an underpainting in midnight blue (a mix of phthalo blue and black) on a piece of canvas cloth that I had coated with gesso. Then I did a layer of small block prints in white and gray on the blue, and went back over it, hand painting in white, grays and red, highlighting or exaggerating shapes I liked. I wanted to leave branches showing against the sky, so I used negative painting in a warm blue mixed with titanium white and painted the sky around the branches, freehand. I had found this great article in a Reader's Digest from around 1960 called Why Young Mothers Feel Trapped. I cut out a portion of the picture and the title in the shape of two little birds. I used some more of the very old catalog pages (see previous posts) from an ad which had in bold Boys and Girls and used it to make a nest. Here is the result. It is in the stage where I am watching and waiting to see whether it is done. Here is a piece I finished today. It is also mixed media using acrylic paint and collage. I started with torn pieces of a reproduction of one of my acrylic paintings called Lights of Home. I cut small bird shapes from vintage papers and printed on the canvas and the birds with my hand-carved, small, shaped printmaking blocks. 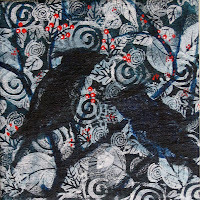 Its title is not all I would wish, but will do for now-- Two Little Birds. There's lots more to show and tell, but I will save it for later! Not too long ago one of my artist friends shared some very old pages of a Sears and Roebuck catalog with me. Having used some pages from a magazine from the early 1960's in a recent work, I figured I would find a way to use these as well. It would need to be soon, however, because the pages were so fragile, just touching them made them break apart. I took several sheets, including some advertisements and what looked to be newspaper articles and stories, and as you can see above, some ads for ladies and children's clothing and undergarments from the turn of the last century. The only date I could see on any of the pages was 1899. I spent today working with the pages, beginning with a page of ads and articles, one of which began in larger type than the words around it, "If a red hand..." That was just too intriguing! So I took a sheet of printmaking material, 9 x 12 soft block that my husband had given me for Valentine's Day (he knows the way to MY heart!) and traced my hand and wrist on a piece approximately 6 x 9. See the delicate thing below! I also used some Butterick dress pattern paper along with the very old catalog paper to create the first layer of my piece, using matte medium to coat the back and front of each piece. Birds had to come into the design somewhere, so you see them perching on my thumb and pinkie, and I made a larger bird block which I also printed in red on the collaged papers. Here is what I have done so far. I will let it be for a while and listen to it tell me what's next! In case you are wondering, "if a red hand" appears on the first page of your newspaper, it is time to renew your subscription! I had an piece of map that I wanted to use in collage. One way to make a sturdier element is to turn a paper piece into a gel transfer. This is done by coating the item over and over (usually at least 3 times) with acrylic matte medium and then allowing it to dry for 24 hours. Soak the item in water and rub the paper off the back. It creates a plasticized collage piece that has some transparency. My son entered a piece of artwork in the current show at LibertyTown called Young Fredericksburg Here is the piece, which sold this week! He also created some ephemeral art today and cleaned the hand building table at the same time. Here is Matt's rendition of Our Founder, Dan Finnegan. And lest you think he is the only one in the family being artistic. I am creeping up on starting something on these cool pieces of plywood from a packing crate that Rob gave me. Below, see new pendants. The picture of the first one is not good--the light was terrible. The square bead is a red ceramic and the matching ones are yellow frosted glass beads. I love slate shaped like above. It makes a fun faux bead piece. A Change of Scenery is a painting that I really enjoyed working on in September of last year. I started with muslin which I covered with three coats of gesso. Then, able to work flat on my table, I used my hand carved soft blocks, and printed all over to create the fall leaves. 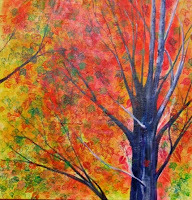 I have used this same photo for at least two other paintings because it is so beautiful with its mixture of oranges, reds, golds and greens. The photo has a white birch in the foreground, and I had painted that birch in the other pieces. But, this one, I liked as it was with only the dark tree. The more I lived with it, though, the less I liked the starkness of the cool yellow I had used so genrously. I wanted to warm the painting up. Finally, during repaint and refurbish season (going on now! ), I have gotten it back off of the wall to play with. By now, of course, I have stretched it, so using my blocks on it is not as easy. For the changes, I used brushes instead. I began to add warm reds and oranges and golds painting over or around the prints and shapes I had made earlier. Then I began to paint in a warm blue mixed with titanium white to create the open places you see through trees to the sky. I paint instinctively when I get going --it's really an exploration. I already don't like what is there, so it frees me to do whatever I think might make it a better painting. I think I am done with it now--at least for this refurbishment season! I think I'm ready for spring migration, or something. Birds keep popping up in my paintings. Here's another one!